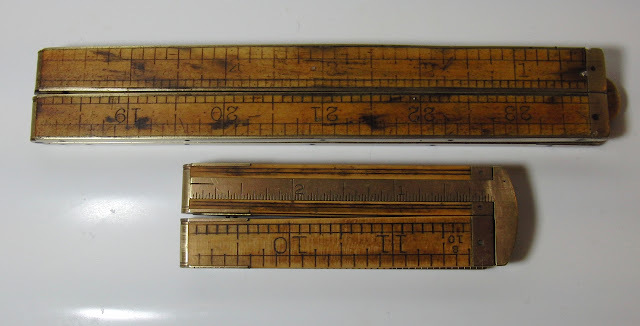 I've been buying old folding rulers on ebay. They can be valuable collectibles worth hundreds of dollars. Cleaning one of these aggressively would ruin their value if they were in good collectible condition. I look for the ones that are really darkened with filth and cost less than $10, then I go to work on them. Is there even a 1 there? 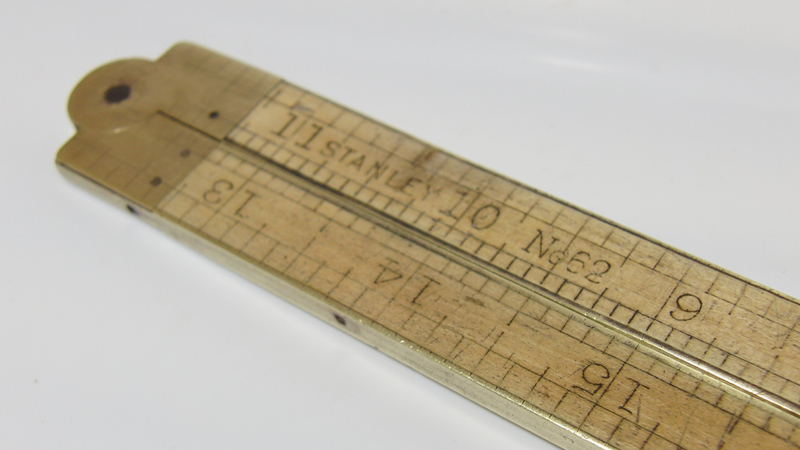 What is that grossness on the brass tip? Here is my secret ingredient. 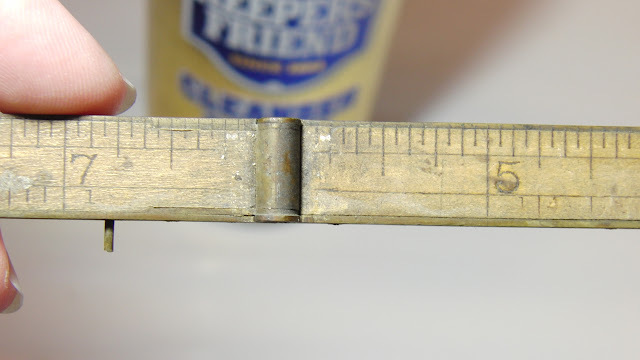 Bar Keepers Friend contains feldspar, surfactants, and oxalic acid. Oxalic acid, C2H204, is a simple organic acid. In the realm of everyday household cleaners it is a stronger acid than vinegar. It's not toxic in low quantities. Oxalic acid is even in lots of foods, notably spinach and Brussels sprouts. 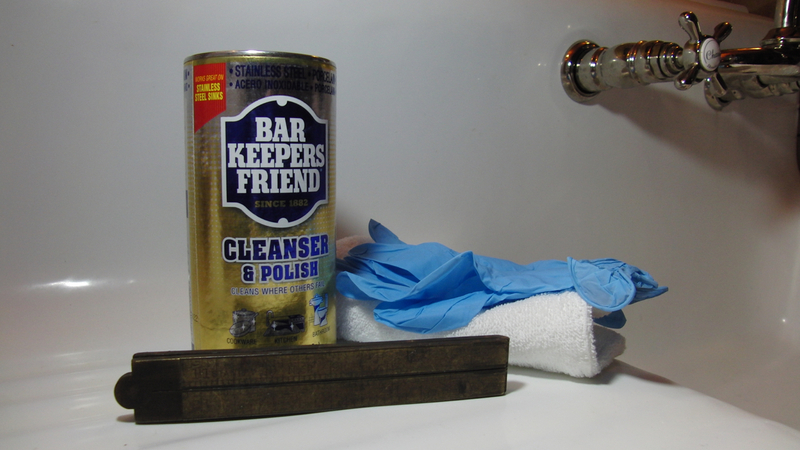 Bar Keepers Friend has a faint funky metallic bouquet which I don't find objectionable. Prolonged skin contact is bad for you, so wear gloves. I find it discolors the gloves immediately so I'm always glad I have them on. Right before I put on my gloves I hit play on my audiobook and started a stopwatch. 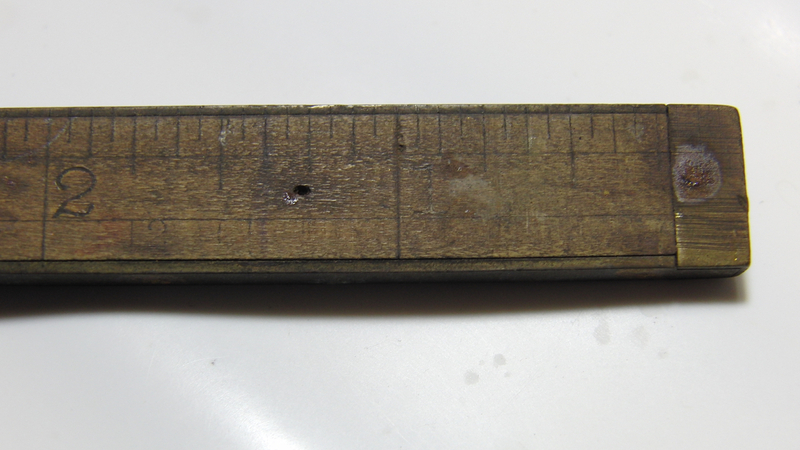 I scrubbed this ruler for 24 minutes. Then I rinsed it, dried it with a towel and left it overnight to get completely dry. The next step is to oil the hinges and the wood. I used what I have on hand. I have a Lufkin 386 12 inch ruler with caliper that I cleaned last week. 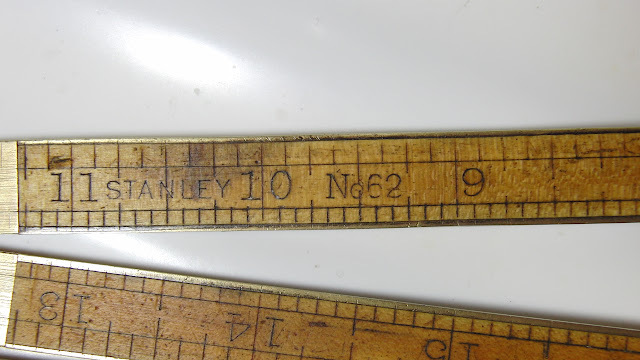 I love these old rulers. 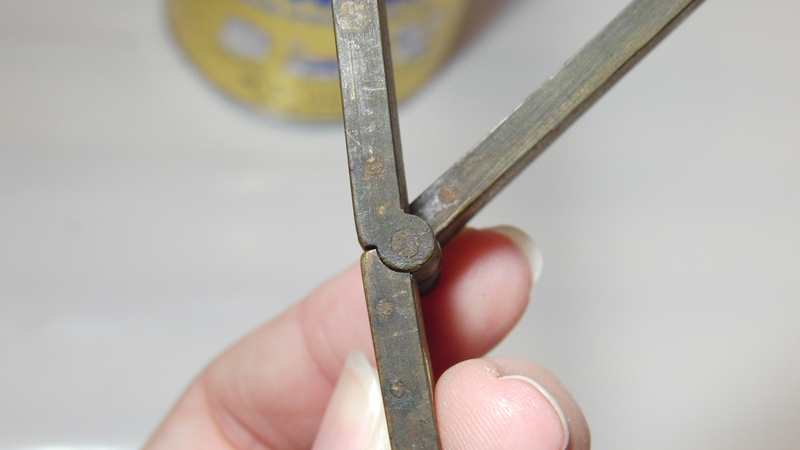 I want more of the ones that fold down to 3", preferably without the caliper. Decreases the weight. They would be neat accessories for a knitting kit. 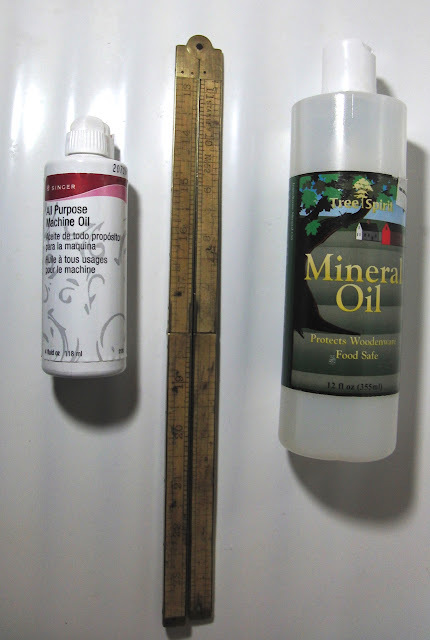 In addition to mineral oil I have also polished these with paraffin wax. 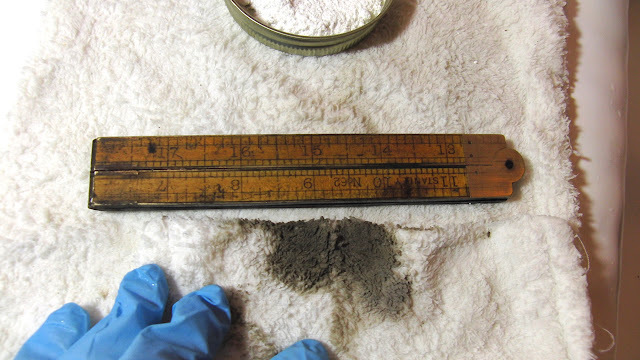 I rub some on in solid form and buff it off the brass and wood. I imagine it might slow corrosion. 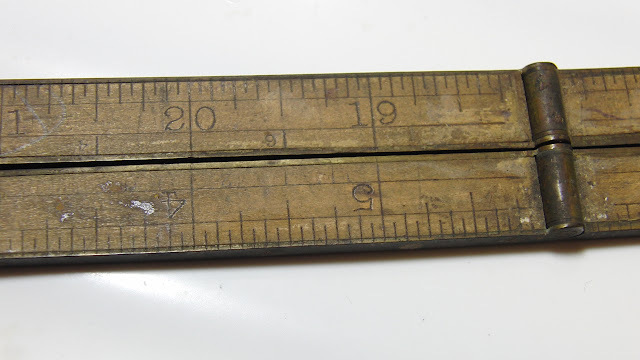 I think if you rubbed a lot of solid wax on one then carried it in your pocket for a day it would work even better. For a quick touch up for the caliper you can buff the metal bit with waxed paper. I keep some around my lab to polish my wooden knitting needles.